Okay so Envy doesn't have Green eyes but I'm sure some of you will get the reference. Anyway, this is a wall of Envy obviously, I suppose the hardest part would be the scan and the moon. 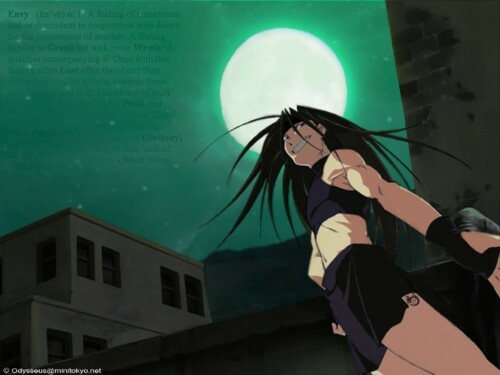 The scan I used of Envy was pretty poor quality. I had to do lots of cleaning up and redrawing. Even though it still doesn't looks great, it's a whole lot better then it was. (To see how it was go here: http://img137.imageshack.us/img137/6240/envyoriginal0zd.jpg ) The moon was difficult because everytime I tried to get it to blend with the sky color, it always came out.. wrong. Kind of blotched and what not. nice concept of wallie, an evil smile across a dark full moon place..
its just this wallie lacks some additional effects to make this more eerie such a flying bats and wandering spirits near the featured character (cuz the character looks like a shaman). ehehehe. in addition to this commentary, (dont yell at me.... t.t), the moon is very simple for this wallie. i guess a little mist or cloud covering the moon will do to make this a very cool wallie..
Nice design,but the moon color is not match the character. I think it will more better if you put something else in the bg. the buildings look good and i really like how you got all the text in there with all of the sins! the moon looks good and you did a very nice job cleaning up the scan of Envy. wow, you got envy at a great angle and the title fits the wall perfectly. Envy is my favorite charactert thx for sharing it. looks good, though the text and moon are out of place. the composition and buildings are great though.